First off, I’m still basking in the afterglow of “FormulaOneItus” at Austin, Texas and as always - I’m now playing ‘Ketsup with Der Vurld de Motorsporten; Ja-Ja!! Thus didn’t have time to squeeze in the latest Young Guns outing from Yas Isle preceding Austin. And I notice I managed to skip last year’s Young Drivers test in Abu Dhabi too; not sure why? 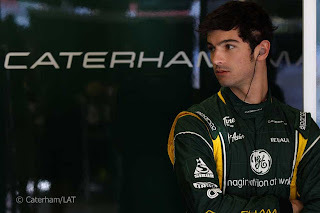 Alas, I have now gone back and discovered that this year’s Caterham F1 test driver Alexander Rossi did take part for the then Lotus-Renault team. NO! NOT that Lotus-Renault, but the other Lotus-Renault; you know the one that wasn’t named Lotus Renault GP, which was the former Renault F1 team... Instead Rossi was with the former Lotus F1 Racing Team; Oh Never Mind! EGADS! Aren’t we A-L-L glad that the Loti double entendre thingy is now over! 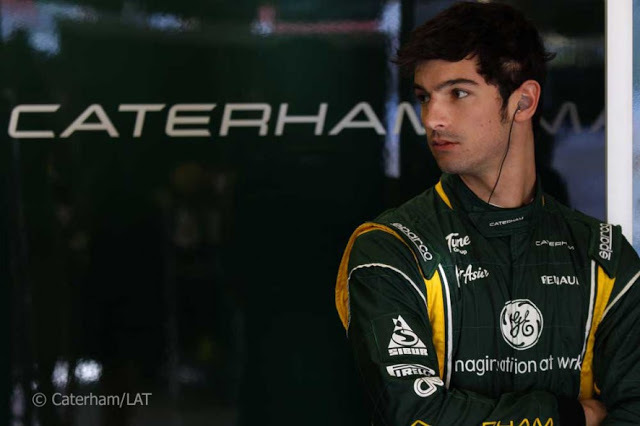 Thus Rossi is firmly aligned with the Caterham concern, while last year’s test actually saw all three of my future Formula 1 driver picks participating, with Rossi, “thee Young Wicky,” nee Robert Wickens and Esteban Gutierrez all at Abu Dhabi. Wickens drove for both le Reggie (Renault) and Virgin and Gutierrez drove for Sauber. And remember that the Young Drivers test is only available for drivers who haven’t contested more than two Grand Prix’s in the past two years. Yet this year’s Young Drivers Test format seems quite amuck, especially since the various F1 Constructors have decided to do their testing at different venues on different dates - having seen tests run at both Silverstone and Magny Cours, marking the return of Formula 1 machinery to France for the first time since 2008. Hispania, Marussia and Williams participated at a bleakly overcast Silverstone during two days of British summer following the British GP where the first Chinese-born national Ma Qing Hua, 24-years old made history driving a Formula 1 car by running 54-laps for HRT. Ferrari, Force India and Mercedes took to the track at Magny Cours from 11-13, September, where appropriately native son Jules Bianchi topped the time sheets all three days. Next up, the remaining Constructors ran at Abu Dhabi from 6-8, November, following the Abu Dhabi Grand Prix - where Caterham, Lotus, McLaren, Red Bull, Sauber and Scuderia Toro Rosso all took turns running their young charges. Was caught totally unawares by the name Kevin Magnussen being at the top of the timesheets for Day-1 in the MP4-27; as yeah, that name should sound familiar, as Kevin’s father is known as ‘MAGS over here in Sports Car land, aka Jan Magnussen, the former F1 and IndyCar driver. On the first day’s outing, the Himwal based team ran Netherlands Robin Frijns, possibly as a reward for winning this year’s World Series by Renault 3.5 series, although traditionally that prize has been doled out by Renault in years past; as Frijns mentioned how completely knackered he was from the amazing braking forces of modern F1 chassis. First day testing saw Luiz Razia behind the keyboard of the team’s STR-07 before Venezuela’s Johnny Cecotto Jr took over on Day-2 with Razia returning for Day-3, fever and all! And like 2010’s results, when ultimately four testers named Jerome D’Ambrosio, Paul di Resta, Pastor Maldonado and Daniel Ricciardo graduated into becoming race drivers, last year’s Young Driver participants saw two more advance - with both being from France. As Jean-Eric Vergne not only topped the timesheets in the all conquering Red Bull RB7, but landed a seat at its ‘lil ‘Seester team Scuderia Toro Rosso. And Charles Pic made his way into the rebranded Virgin Racing squad Marussia with the help of his family’s trucking business. Paffett, Razia, Rossi and Turvey all driving at the Yas Island circuit once again, obviously hoping to follow in the footsteps of Vergne and Pic, albeit the latter’s ride seems somewhat in doubt, with Max Chilton’s name being bandied about. So who’ll make the cut for 2013? You make the call!